The budget document contains the FY2014/FY2015 biennium budget for Greenville County and describes how the County government plans to meet the community’s needs. This document is not only an assembly of information required for making policy and resource decisions; it is also a resource for citizens in learning more about the operation of their county government. 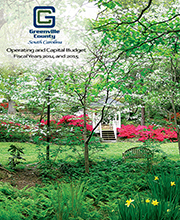 This section contains the County Administrator’s budget message which outlines key features of the FY2014/FY2015 biennium budget and a discussion of past and future challenges in budgeting. The message also discusses underlying administrative practices that support the County’s budget goals. The Appendix Section contains statistical information about Greenville County, a glossary and an index for the budget document. This section also includes the approved budget ordinances for both years of the biennium. About the Cover: The cover was designed by Anna Rodrigue, an employee of the Greenville County Information Systems Division in web design/development. It is an artistic stylization of a photograph taken in this beautiful garden in bloom.